A quick thank you to McDonalds for picking up George Lucas' baton in the race to see who can poo on the most of Mint Custard's childhood loves. The world's favourite surrogate parent and cholesterol provider is back annoying the French Ministry for Culture by sidling up to Albert Uderzo with huge bags of cash to draw them this picture of Asterix, Obelix and co - presumably getting high on McFlurry e-numbers and that weird sugary bread rather than their usual ale and roast boar. Still there's just something about the idea of our indomitable Gauls selling out to Maccas, particularly after the way French anti-globalisation campaigner / nutcase José Bové was portrayed as a real life Astérix for driving his tractor into a McDonald's restaurant. He may just have been another pissed off French farmer and obviously destroying one McDdo was never going to bring down the Empire, but this is a powerful way for it to strike back. I will admit I'm not totally averse to a bit of fast food franchise plastic toy collectible action when its done right. I have a marvellous Simpsons-sofa-and-family on top of my telly that my brother-in-law ate many pieces of chicken for once. Still, it's rare that the association between childhood icons and take away food results in anything more than piles of scruffy unloved and unwanted plastic at school fetes and garage sales. 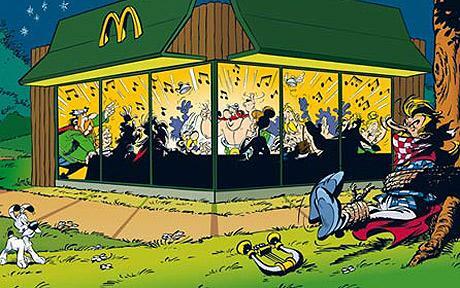 Ultimately what I find most (ahem) galling about this is the way Uderzo has taken one of his best known and loved images (the traditional post adventure feast with Cacofonix / Assurancetourix bound up for the safety of everyone's ears) and cheapened it for the golden arches. Let them give away little plastic figurines for kids to play with, but at least leave those of us who don't eat at Maccas with our memories intact. Asterix may not be les beaux arts but it means something to me and probably to the 325 million people who've shared in their adventures, by Toutatis.